Bollywood movies and Indian society have a close relationship. Movies take inspiration from the society and society gets inspired from Bollywood movies. Bollywood movies inspire several different social factors; one of them is the dressing style. Most people try to copy the style of their favorite actresses or actors. When it comes to being fashionable and looking like their favorite actresses, the women are always a step ahead. 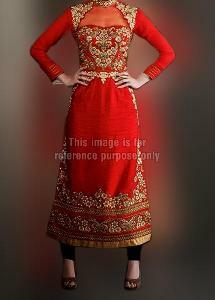 We are constantly working to provide the women with the best collection of Indian ethnic wear and party wear dresses. Keeping up with the trend, we are offering a wide range of Bollywood collection of Celebrity Suit Collection Online and Bollywood Anarkali Suits, Pajami Suits etc. You can Buy Bollywood Designer Salwar Suits from a variety of options that we have made available. Some of our collections of Designer Bollywood Salwar Suits include Jenelia Purple Anarkali, Shradha Kapoor Designer Suit, Shradha Kapoor Salwar Suit, Alia Bhatt Pajami Suit, Sridevi Grey Designer Suit and Madhuri Yellow Anarkali. We provide them the best range of Bollywood Salwar Suits Online at reasonable prices.